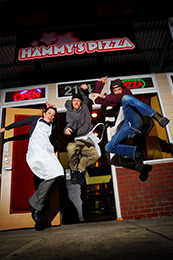 Hammy's Pizza is a carryout and delivery pizzeria located in the Hosford-Abernethy neighborhood of SE Portland. Whether you are looking for a traditional pizza	dinner or a late night snack (delivery until 4am!!! ), Hammy's Pizza will consistently meet your needs in a fast and friendly manner. *Deliveries are $10 minimum, credit/debit only after 10pm.